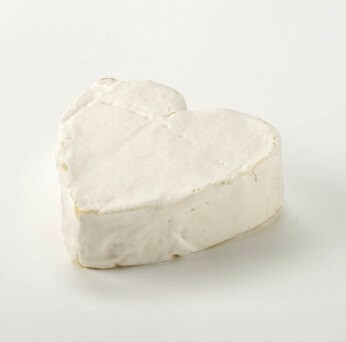 Produced in the humid region of the Haute-Normandy, Neufchâtel cheeses are fabricated in the artisan way and can take on several forms with the most widespread being the original and surprising heart-shape, 'le coeur'. The story goes that the young women of Neufchâtel-en-Bray offered this cheese to their gallant knights during the Hundred Years War. The monks preferred to say that it represented the wings of an angel. The cheese became very popular in Paris in the early 1800s and is still well-loved today. The Coeur de Neufchatel has been protected as a cheese since 1977, earning it a Protected Designation of Origin (PDO). Close relation to the Camembert cheese in its texture and taste, some people actually prefer the Neufchâtel with its coarse, earthy taste and deeper rind. In 2006, 1532 tons of Neufchâtel cheese was produced by 23 farm producers, 4 artisan producers and 2 dairies.